Douglas College’s Hole in One participants donated 1,130 meals to the Port Moody SHARE Food Bank. 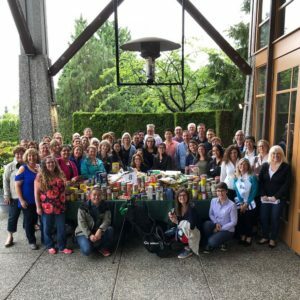 Using Catalyst Global’s Hole in One activity, a 250-person group from First West Credit Union completed the 90-minute challenge at Whistlers’ conference centre as part of its Feed the Valley and Full Cupboard campaign, donating 11,362 meals to three food banks. Hole in One was also used by a 40-person group from Douglas College. which donated more than 1,130 meals to Port Moody’s SHARE Food Bank—the single biggest donation of goods the organization can remember seeing. Hole in One is a team-building activity that see participants work in teams to design and build a fun, challenging and conceptually unique mini-golf course out of non-perishable food donations. Once the course is built, the teams play a tournament using putters they have designed and constructed themselves. At the end of the tournament, the non-perishable food items are calculated into meals for donation to the team’s chosen charity. Eventology has exclusive rights to deliver Catalyst Global’s corporate social responsibility (CSR) products and activities in Canada. Catalyst has designed CSR activities and team-building games for more than 30 years and has a network of representatives in over 40 countries.